Virtual Community: Good, Bad, Neutral? Do you agree or disagree? Has your experience with virtual community–email, chatrooms, networks, blogging, etc–resulted in a strengthened pursuit of real community?� Perhaps you wouldn’t even divide cybercommunity from neighborly community? 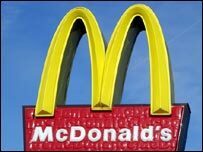 Fast-food giant McDonald’s has launched a petition to get the dictionary definition of a McJob changed. The Oxford English Dictionary currently defines a McJob as “an unstimulating low-paid job with few prospects”. McDonald’s is claiming that this definition is now “out of date and insulting”, and had performed a survey which found that 69% of the UK population agree the definition needs updating. I�ll never forget the day I walked into church when one of my esteemed pastors walked up to me and disapprovingly commented: �Is that a rock star haircut, interesting.� Though I jokingly blew off his attack on my hairstyle choice, I knew from his response this was no laughing matter. I had clearly gone the way of the world. His comment made a spiritually mature twenty-seven year old feel like a spiritual infant. Should a simple hairstyle call into question my spiritual life? Peddle back with me about fifteen years to my first church, known by its insiders as �The Mission.� I was the oldest kid in church, a single teen among adults and kids. I always wondered why there weren�t any other teenagers. As I matured, the reason became apparent. Not only were there no teenagers, there were rarely any newcomers. The Mission firmly believed its role in the kingdom of God was to pray for revival; that�s it. No evangelism, no cultural engagement, no social justice, and for many, no secular music, no television, and no �questionable� clothing. The holy church was disengaged from unholy American culture. I�m sure you could add scores of examples to this church against culture phenomenon, examples which illustrate that many churches have reduced the cultural mandate to a proof text for having babies: �Be fruitful and multiply, and fill the earth and subdue it and have dominion�� (Gen 1.28). According to this ancient mandate, to be made in the image of God is not merely to produce more spitting images, but to raise children into citizens who creatively participate in making the earth into a culturally rich habitat, a place that clearly and carefully reflects the creativity of its Creator. On the other hand, I have also visited churches that are so immersed in culture�feeding the poor, caring for the environment, and keeping church in fashion, that they have neglected the Great Commission: �Go, therefore, and make disciples of all nations, baptizing them in the name of the Father, Son and Holy Spirit and teaching them to obey all that I have commanded and behold, I will be with you always, even to the end of the age� (Matt. 28.19-20). These churches spend so much time being culturally relevant; they forsake the mandate of Jesus to make disciples who obey everything he commanded. They produce hip, not holy disciples. Does the Church have to choose between hip and holy? Why does the dichotomy exist between Great Commission churches/Christians and cultural mandate churches/Christians? How can this dichotomy be corrected? Noted historian Mark Noll has documented the pendulum of evangelical postures regarding church and culture. In an article entitled �Where We Are and How We Got Here?� He demonstrates the absence of significant evangelical thought and action in the first half of the 20th century. White American evangelicals abandoned serious engagement with academia, popular culture, and politics. The in-house fundamentalist-modernist controversy left Christians disconnected and quarantined from the ideas of the university, the burgeoning impact of television, and civil rights legislature. However, the second half of the 20th century presented a new evangelical�concerned, engaged, and actively influencing culture. Noll notes two key developments that contributed to a shift in evangelical posture towards culture. Immigration reform led to an influx of de-Europeanized Christians, bolstering evangelical numbers, and the civil rights movement was launched from the southern African American evangelical church. As a result, American evangelicalism grew in number and influence. Subsequently, three culturally reforming movements followed�volunteer organizations (Young Life, Campus Crusade, Fuller Seminary), charismatic movements, and the Jesus People. Where do you think we went from the 70s? Where does American evangelicalism stand now on the church and culture continuum? Mark Noll, �Where We Are and How We Got Here?� Sept 29, 2006, Christianity Today. Kevin Vanhoozer, Everyday Theology – The first chapter is worth the whole book; the rest of the book is a collection of his methodology applied by students from his Cultural Hermeneutics course at Trinity Seminary. Vanhoozer turns his hermeneutical and linguistic savvy (cf. Is There Meaning in This Text?) to developing a framework for interpreting culture. He notes that the are cultural texts (products, forms, stuff) and cultural trends (intangible effects of cultural texts), both of which must be carefully interpreted if we are to redemptively engage our cultures. Drawing on Mortimer Adler, he proposes that we understand the world in, behind, and in front of a cultural text. Strong echoes of Marshal McLuhan are present throughout. On the downside, Vanhoozer imports too much lingusitic terminology for everyday readers (locutionary, perlocutionary, illocutionary) to communicate his framework, which could be presented with more accessible language. He also notes the importance of using the creation-fall-redemption storyline in interpreting cultural text and trends, but does not deliver on how or why this is important. Though far from “everyday” in places, overall he presents a cultural hermeneutic that is compelling and intriguing.